Roofing repair is a common, annoying necessity. With the sun’s heat, shingles (and a roof in general) will expand. This leads to nails popping out, which can leave holes for leaks. If you’re new here, leaks = bad. Read on for some basic steps on replacing a roof. When you are repairing roof tile, consider renting a nail gun. Nail gun rental can cost around $20 a day, which can save you the time of hammering. Worth it! Pro contractors, Georgia Pacific, released this video for specs and detailed instructions on laying sheathing and spacing for nails. This can differ depending on the spacing of your rafters. Also take into account nail length you will need to pierce through the necessary layers. According to IKO, “Roofing nails should be long enough to penetrate the roofing material and go 19 mm into OSB, solid wood, plywood or non-veneer wood decking, or through thickness of decking, whichever is less. To determine the nail length, you should consider the number of layers of shingles, shingle thicknesses, underlayment and flashings (installed on eaves, sidewalls and valleys, etc. ).” Long story short, you still need to look into specifications for your particular roof. Begin by clearing any debris or leaves from your roof. Depending on your issue, you might need to repair or lay down new sheathing. Lay down your sheathing (also known as decking), which is usually half inch thick plywood, 8 feet long. This is standard. Obviously every roof is different and you might have to cut your sheathing to fit your roof’s measurements. Once you have your sheathing measured and cut, nail it to your roof’s rafters. Lay your sheathing in a brick pattern; this will give your roof extra strength. See Figure Below. Felt paper is what sits between your shingles and your plywood sheathing. Staple your 6 inch starter strip of felt paper at the bottom of the roof, near the gutter. Leave 1 inch to overhang over the roof. This helps weather elements to drain off the roof into the gutter. Just like you will do with your shingles later, overlap the felt paper with about two inches over the piece of felt paper below it. Make sure to reinforce the tar adhesive strip on each piece of felt paper with nails. You can’t reshingle your roof without shingles! Figure out if you are repairing roof tile (usually clay, ceramic, or wood), asphalt shingles (also known as composite or 3 tab), or architectural shingles (also known as laminate). Lay your shingles starting at the bottom corner of the sloped roof with your starter course. Work your way to the top, overlapping the top shingles over the row beneath them. This will make it so precipitation doesn’t penetrate the roof and lead to damage. Work out from the bottom corner in a pyramid shape. Six nails along the tar strip of each shingle should be adequate for utmost performance and hold. Work from the bottom up, building from your original pyramid shape. If you are doing roof shingle repair for an isolated part of your roof, perhaps a part where the shingles were damaged, don’t remove the old ones, just nail the new on top of them. This leaves a consistent, smooth look. If you’re trying to do roof repair in winter, read this article for some extra tips. If not, still read it! Contractors save time by stacking several bundles of shingles on a roof before installing them. However, if stacked poorly, the shingles (or roof) can become damaged, which will adversely affect the overall longevity of the roof. Read on for some tips and tricks for stacking shingles on a roof. Lightly lay the shingles on the roof flat. Leave them in the package for extra protection and so they stay together. With three tab shingles, which are thinner and lighter, you can lay them over hips or roof ridges. Be careful not to lay too many in one place, as this could create too much weight that might weaken the roof. If you are using laminate shingles (also known as architectural shingles), try not to lay them over ridges. Because they are thicker and heavier, they are more likely to compromise the integrity of the roof. Laminate shingles also have two-layers, which give them dimension. However, it also makes them more resistant to bending, and more likely to be damaged or misaligned between their two layers if dropped or bent over a ridge. A typical bundle weighs 75-80 pounds, which can quickly lead to a lot of pressure if you stack them on top of each other. Another reason to avoid stacking too many is to not risk them toppling over and becoming damaged. If you are using asphalt composite shingles, 9 stacked bundles is probably the limit. If a roof has a high pitch, nail a board below where you’ll put the shingles to prevent them from sliding down, being a safety hazard, or knocking into other tiles and damaging them. Try not to stack your bundles in vulnerable places on your roof, such as in valleys. You will increase risk of damage. Lay your bundles in all different locations on the roof. This will both distribute the weight evenly to prevent damage, and make the shingles easier to access during your process, improving your workflow. Some roofers stack bundles over ridges with the intention of separating the asphalt shingles from each other. This is called “breaking the bundles.” It is crucial that this still be done gently, as the bundles could harm the roof if it is done forcefully. Hot weather affects composite, asphalt, 3-tab shingles by making them more pliable. The shingle sealant is in the center of the bundle and is also heat activated. This might be problematic if it sets and makes the shingles stick together. Laminate shingles don’t tend to have this same problem since they have adhesive towards the edges. If you lay the asphalt shingles granule side up, the adhesive won’t stick as much and might help in being able to remove individual shingles from the bundle. Keep your shingle bundles in the shade. When it is time to bring them on top of the roof, try to keep them in the shade (i.e. a chimney or shaded area of the roof) if it’s available. Cold weather has the opposite effect on shingles. It tends to make them more brittle and less flexible. Cap shingles that cover hips and ridges become especially sensitive to breakage if it’s cold. Keep your bundles in a warm truck cab for as long as possible before use. Even better, get a bulk material warmer that will keep your shingles and adhesive warm enough to use around the clock. You might initially start laying shingles on a clean surface, but make sure to be aware of any dirt or debris that might fly up onto the roof. If it gets into the adhesive, it will diminish its wind resistance significantly. Read more about wind damaged shingles here. If you live in the United States, it’s likely your roof has asphalt shingles. American homeowners use asphalt shingles more than any other roofing product. Proper installation of this material will provide many years of protection. 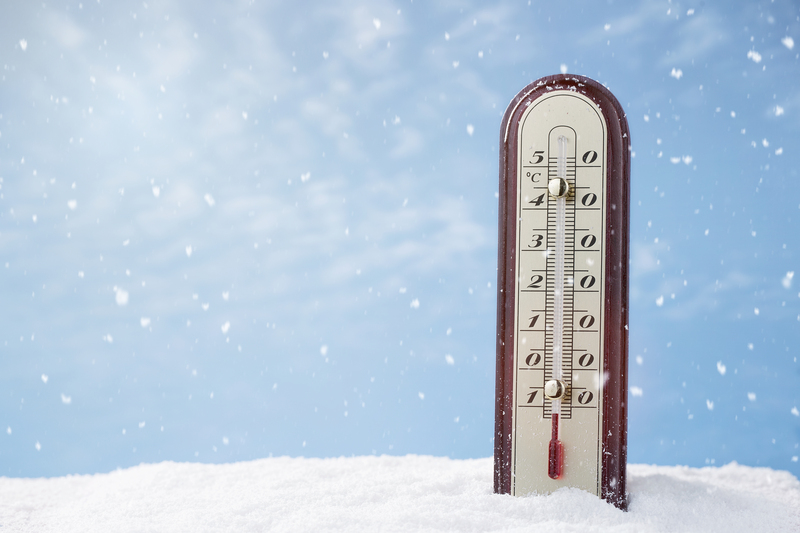 Unfortunately, if you are roofing in cold weather, you will need to take some extra precautions. As temperatures decline, shingles become more brittle, and are easily cracked and broken. Cracks lead to one thing: water leaks. Years ago it was common for shingles to crack and blow away in wind storms. Manufacturers solved this problem with a self-sealing compound that cements one shingle to another (a thermoplastic compound). Introduced in the mid-1960s, it is a common ingredient of virtually every asphalt shingle manufactured. The sealing compound is activated by the heat of the sun. This sealing can happen in colder temperatures, but direct sunlight is required. North sloped roofs may not get the necessary sunlight until spring/summer. When the bonding process is complete, the shingles are less likely to develop wind-related leaks and failures. The ideal temperature range to install shingles is between 70 and 80 degrees Fahrenheit (21 and 27 degrees Celsius). If temperatures are colder than 70 degrees, the adhesive will not reach the ideal elasticity and will not create a perfect seal. 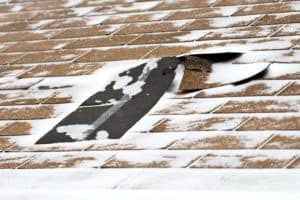 If roofing in cold weather is unavoidable, most asphalt shingle manufacturers require that a specialized adhesive is manually applied to each shingle for temperatures below 40 degrees Fahrenheit (4 degrees Celsius). Failure to apply the special adhesive in adverse temperatures will void the manufacturer warranty. Powerblanket has a solution for roofing in cold weather. The Powerblanket® Hot Box will maintain the desired temperature of your shingles and adhesive on site. Roofing in cold weather is not ideal; however, P owerblanket makes it much easier than it has been in the past. Powerblanket Hot Boxes save you money by keeping your products from freezing without the risk of overheating. Hot Box pallet warmers are easily assembled and taken apart. Hot boxes are ideal for cold weather storage, freeze protection, transporting, job site heating, remote location use, and roofing in cold weather. Standard Hot Boxes hold product between 100°F and 120°F (38°C and 49°C), and optional adjustable thermostatic controllers allow temperatures to be precisely controlled. Heat materials and palletized products: adhesives, shingles, paint, caulk, resins, epoxies, etc.